Andy Steele (AS): Dr. Leroy Hulsey got a BS in civil engineering I 1965 from the Missouri School of Mines and Metallurgy and an MS in civil engineering from the University of Missouri at Rolla in 1966. He did post-graduate work at the University of Illinois at the Ph.D. level from 1968 to 1971, and in 1976 he got his Ph.D. in structural engineering from the University of Missouri at Rolla. He has owned and run three high-tech engineering research corporations and has extensive teaching and research experience. Currently he’s the chair of the civil engineering and environmental engineering department at the University of Alaska Fairbanks. We’re going to be talking about the World Trade Center 7 Study, giving an important update to our audience. He’s here to do that. First, Dr. Hulsey, I just want to welcome you back to 9/11 Free Fall. Leroy Hulsey (LH): Thank you. I appreciate that. AS: Before we get started, for newcomers, people who may not be aware of who you are and what the study is about, briefly tell us more about yourself and why you decided to undertake this study. At the end of the day, I began the study for the sole purpose of bringing the truth to what had been done previously and try to explain how this building may have come down, or may not have—I may not be able to fully explain it, but we can certainly tell you what didn’t happen. That’s what my goals have been from the very beginning—to at least establish that pattern. Right now we’re close to having everything completed. AS: Please tell us what the study is, and also tell us what a finite element analysis is, exactly, for the layman. LH: Okay, so as a forensic engineer, I would typically like to take a building that has come down and try to explain every little detail of what may have happened, what may have transpired. And typically you would have the broken elements of the building there to sort your way through, to have metallurgical tests done on the samples. You’d do all kinds of investigations on various parts and pieces in the laboratory. And then through that process that’s the experimental process. And then from there you would develop basically a computer model to simulate what that building truly was in the real world. That is what we often call a finite element model, meaning that we take the system in its entirety and break it up in discrete little pieces and then put it all back together, so it looks like the real structure. A jigsaw puzzle is an example of taking a beautiful picture and cutting it up in all these little pieces and if put back together right, it looks the original picture. That’s what this does, except mathematically, we can then begin to look at the stress throughout each one of those little pieces and how they connect to each other and how they respond and work together. That’s what we ended up doing—using two finite element computer programs for the whole purpose of being able to understand, as the result of certain effects, how that building might respond to those conditions. And then we also used the two computer programs for the purpose of correlating the results to see if the two models with two different programs were giving us comparable, if not the same, results. I also had two Ph.D. working for me—one of those is still with me, the other graduated. They did, individually, evaluations of the same stuff, so that we could correlate their thinking with each other. And also, as a third quality control standard, I then reviewed their work. So the process was checked and checked and rechecked to ensure that what we were doing was accurate and that our interpretations of the results were the same. Now keep in mind, when I said that initially, as a forensic engineer, I would start experimentally, we didn’t have that option here. We did not have the option of having parts and pieces and crumbled debris to be able to evaluate the materials. That just wasn’t an option for us. However, what we did use was the erection drawings: Take those erection drawings, which is what the building was built by, and from that create our computer models. But we were not able to correlate against experimental damages that were out there in the field. That was all hauled away before we ever had access to it, unfortunately. And so, though that is an issue that concerned me. But we feel like what we’ve done is quite accurate and quite understandable and very beneficial to help you understand what may have actually happened here. What you haven’t seen anything about—I made a presentation on September 6th last year. I haven’t said anything since. Since September 6th we’ve been working on progressive collapse and those issues. At that time, I said very clearly and emphatically that fire did not bring this building down. Since then, we’ve been looking at various aspects of what the building collapse might look like. Right now I can tell you, without anybody seeing it yet, that if you take our building and put it in a video beside the real building coming down, the two side by side, they look almost identical, which is quite different than what you’ve seen previously by the analysis that was done by NIST. Their building looks quite different in the way it comes down versus the way the true building came down. So at this point in time, we are effectively about two weeks from having all of the analysis done on the progressive collapse. We’re basically just going through and refining it. Then we will have a report by the end of the year. The idea there is to try to have sufficient people reviewing our work to provide a peer review of our effort. That would be in the structural area, perhaps the materials side, perhaps the architectural side, so that we have truly a quality review by the peers. So that’s where we are. We’re close to being done. We intend to have everything written by somewhere before the end of the year. AS: Right. And it’s impressive work. I know a lot of effort has been put into it by yourself, by the graduate students. And this is a very important study that is coming out here. I mean, it’s probably one of the most important ones in our century currently. And I’m not overstating it, because this is a very controversial issue. A lot of engineers are not satisfied with the story that we’ve gotten from NIST. A lot of family members are not satisfied. And this is actually doing what NIST should have done. I want to go back to what you said about how your model looks more like the building as it comes down as opposed to NIST’s, which, from my own layman point of view, looks like one of those novelty soda cans crinkling in the Spencer shops—you know, that twists around. I just want you to analyze that a little bit. What do you think you did differently from NIST to achieve that outcome? LH: Well, it’s not completely clear everything they did for progressive collapse, but here’s a couple things that they did do which effects their results. When they modeled the building, they only modeled the connections over part of the floor system. The other part they approximated by what’s called pins and joints—fixed joints and so forth. It turns out that the stiffness within those two areas are quite different by making that decision to try to simplify computer time, if that’s what they were doing. They actually affected the behavior of the structure. And so if you take that idea and you progress it all the way to the 47 stories and begin to look at what happened if you take out some floors and take out some columns and the building starts coming down, you’ll notice that part of that building is quite different in looks than the other part of the building. That’s where the stiffness values are changing. What we’ve done is model the building with connections. We simulated those connections accurately and put in springs to save computer time. But those springs act like the true connections in the building. When you do that, you actually want to get a representation that is highly accurate of what that building would be subjected to if you put a load on it. So that’s at least one of the differences. AS: It’s just interesting that you can do this—recreate the building, throw it through all these different scenarios. We’re going to talk about the different scenarios you’ve tried. But first, for the audience, please describe NIST’s collapse scenario—what they said happened inside the building to make it look like a controlled demolition and how you went about trying to simulate it. You’ve touched on this already, but what steps did you do to try to get that entire internal structure to go down and leave that exterior standing? LH: Well, I don’t know that I’m prepared today to give you all the details of what NIST did. 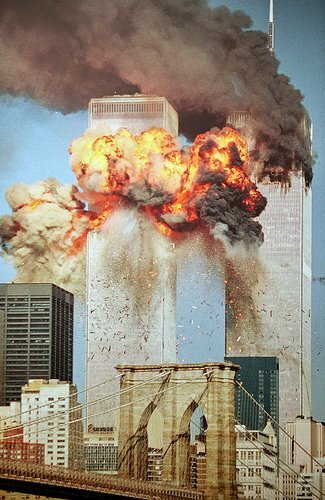 I can tell you how they were looking at column 79 coming down and affecting the floors down below, and the number of floors that were affected. The vertical supporting lateral restraint on the north side only was from floor 8 to floor 13, and they had lateral support buckling initiated over nine floors. That was their argument of what may have actually happened during the collapse. We attempted to do that same simulation and we could not get anywhere close to the answers that they were talking about—using two different computer programs, two different individuals trying to accomplish that same task. There’s just no way that that could’ve occurred, according to our results and our studies. We’ve taken a look at things quite differently than NIST did. Their argument was that the floor was not compositely connected to the girders and didn’t have shear connectors on the beams, and so all of that would affect the behavior. Actually, we found that they did have shear connectors on their girders. We studied it with shear connectors and without shear connectors and found that there was sufficient friction to enable that thing to behave—particularly since there were shear connectors on the beams, and there’s no argument about that. So, consequently, the floor stiffness was quite a bit significantly better than they thought it was. And so when you take a look at that massive concrete resistance, with the floor systems and the beams and the girders all working together as a unit, it’s going to take a tremendous effort to get that to start acting like they were suggesting it had to do. Furthermore, what we determined is that they treated the exterior walls as fixed. That simply was not the case. So we actually applied the connections that actually were installed in the building as springs and simulated the behavior around the exterior of the building as well as the interior of the building to get the performance. So when it begins to move, there is some resistance to rotation, but not a lot. Furthermore, it’s pretty interesting to make sure that if we looked at the concrete floor, it should be connected to the girders and the beams but not necessarily to the columns. So that we looked at as well to evaluate the potential influence of the floor and the beam-girder system and the column system and how that all interacted. The other thing we did which was quite a bit different in terms of the behavior is we actually attempted to get an understanding of the aggregate that was actually used at the job site. Those aggregates have a certain behavioral characteristic both thermally as well as mechanically. AS: Before you continue, what is an aggregate, for our audience? LH: Broken rocks and sand. LH: They put it into cement and water and they stir it up and they take it out to the job site and they pour it—they place it in a set of form and it hardens. And then they use floats to actually float it down. If it’s a trowel finish they trowel it, and then you get a smooth floor system out of it. Once it’s hardened, then it carries load as well. Okay, so then we begin to look at the potential ways that this building could come down. Now keep in mind, we should not forget that we have video of some of building as it comes down. There’s just no doubt about that. The top 26 stories we can see everything that’s going on, at least on one side or two. So if you take our building and you put it there and you subject it to some condition, what happens to your building? What is it going to take to make that building act like the true building? At that point in time, we began to look at alternate things that might have occurred. Lots and lots and lots of people argue that, okay, the interior columns came out first, they went down, and they dragged the exterior columns in, and they buckled and it folded down upon itself. Well, if you look at the video, that couldn’t have happened. And if you look at the video, in another sense there’s an exterior surface on that wall system and that exterior surface is not very structural. So if there’s any movement relative to one column to another, one member to another, you’re going to see it on the surface of that sheathing. And you just don’t see much. Therefore, that tells you automatically, if it’s not bending with respect to its neighbor, not moving with respect to its neighbor, then the two neighbors are going down together. And if that’s the case, there’s no relative displacement between the edges, which means that there’s no warping and there’s no bending and there’s no rippling and there’s no—any of that stuff on that surface. That being said, that’s telling you that it’s a free fall condition. So that’s what we’re finding right now. AS: One thing about this whole issue that I think makes it very difficult is the disagreement over certain facts. And I’ll use one example. In NIST’s report, they claim there is raging fires under the beams that pushed the girder off its seat, but when you look at the actual pictures of an hour before, the fires are out in the area of collapse initiation. So now this takes it into a realm where it’s not just a math problem you give to high school students—you know, 5 plus 7, this is the answer, and one guy does it right and one guy does it wrong—but it’s taking in different evidence points. And NIST, in my view, was selectively making the evidence—fitting it with the results that they wanted to come to. How much did that affect your research into this study? So that’s what we did. And we determined a number of things through that process. First of all, we put the fires there. We let it move. And the first thing we discovered is their movement of five and a half inches—when they first said that it moved off and shoved off the support and that enabled column 79 to not be braced and it came buckling down. Well, guess what: They forgot the fact that there was a stiffener plate there that prevented it from being able to be shoved off. Secondly, there were a number of factors associated with that whole scenario. They also were looking at the expansion of the girder and on the floor system. And if you really stop and take a look at that, when you heat up a floor, it’s going to start moving with respect to the stiffest point. And what NIST did is that they fixed the exterior walls, and when they did that, the floor system moved away from the exterior wall system. And therefore it shoved it. They claimed it shoved it five and a half inches—they later said, I think, it was around six inches—off of that seat. But, again, there was a stiffener there, and it couldn’t have happened. But in our analysis, we did not lock in that exterior wall. We put the connections that were actually built into the building there—as well as the rest of it—and let that thing move. And when it moved, it did not move from the exterior wall inward towards column 79, it moved just the opposite. So we were getting horizontal movements in the neighborhood of one point two (1.2) inches, maybe two inches, not five and a half or six inches. So there was just no way it was going to move off of anything. That automatically says, okay, what they’re saying is not one of those things that could’ve happened. Now, the next question to is ask yourself, “Okay, so were these fires. Really? Where did the combustibles come from?” We’re talking about fires on floors much of which were conditions of business or secure information. Don’t you think that that stuff would’ve been locked up in files and cases, and not out on the desk? And even if was out on the desks, are there enough combustibles to keep that fire raging for that many hours? I just don’t think so. So there are just so many issues with respect to what they were coming up with in terms of a solution, and it was not consistent with what was actually built there. Furthermore, what I did, which was a lot different than they, I attempted to get the actual aggregate for the floor, dolomite. I looked at the thermal expansion and—I wrote a paper about this some years ago, about what it takes to expand the concrete with different aggregates and how that correlates with the steel expansion; they are different. I saw no evidence where they actually considered the floor system expanding at a different rate than the girders and the beams. So all of that also impacted the end result. We looked at all those issues very carefully and looked at the possibility of whether the building could actually have come down as they said it would. And I see no—nothing in our analysis shows that could’ve even remotely been possible. AS: Now you talk about “remotely possible”: The scenario of this girder getting pushed off its seat and all these internal failures happening to cause the inside come down and leave the exterior standing as a shell for a few moments before it comes down—and that’s why it lookslike a controlled demolition, according to them—can the exterior columns ever still stand if the core columns have failed? LH: Well, I don’t know. I can tell you that we were not able to get that to happen. Our analysis does not show that that’s a possibility. We tried to simulate whether they actually buckled inward, as many people argue. We tried to simulate all those conditions, and we used more than one computer program. We even took simpler models to examine the theory behind that whole phenomenon, and it became very clear that that was not going to happen. So, that means something else is happening—right?—to get the conditions they saw. AS: Let’s get into something else there. First I want to ask: What other scenarios were plugged into the finite element analysis besides what they were claiming happened? LH: You mean by them or by us? AS: By NIST, with the official story, obviously you want to check that scenario. But what other scenarios? Because there are people who come out of the woodwork and say, “Well, maybe NIST got it wrong, but I don’t believe it’s controlled demolition. Maybe this or that happened instead.” They’ll throw out theories. What other ideas were looked into? LH: I don’t know that I can be prepared to talk about every little detail that NIST did in that regard today, but I can tell you that we looked at every aspect of what we thought could happen in that scenario. And you’ve got to remember something: This building is not symmetrical. Because it’s not symmetrical, if something happens some place within the building, it’s not going to come straight down. It’s going to come down at an angle or rotate or any number of things, because the centroid of that building is not in the middle. It’s just not. And so if there are things that are going on that cause it to come straight down, then there’s got to be influences to make that happen. And I didn’t see a lot of evidence where they were doing a big study about that thought. We have extensively studied that carefully. I’m not going to tell you that it’s controlled demolition. I’m going to tell you that we looked at various modes of failure, and in those modes of failure we have ended up with a result that looks very, very comparable to what the building actually went through when it came down. LH: I can tell you that we looked at several floor levels, taking out the interior columns. The core columns. And then we delayed the coming down of the exterior columns and we determined that wasn’t what really happened because the behavior was totally different. The columns, if they were going to fold inward, didn’t happen. We tried everything. We looked at the individual column-buckling behavior from the bottom of the substation all the way to the top. We looked at various aspects of every single column to try to understand what it would take to do what many people think it did. We couldn’t ever get it to do those things. So then we started looking at severing the exterior columns as well. And when we began to do that, then the behavior of the system begins to look a lot like the—and I’m talking about after or just simultaneously to the interior columns—then you’re getting a behavior that’s very, very similar to what you see in the video. LH: I don’t believe there is a natural phenomenon that’s going to do that. AS: Well, I will let our audience draw their own conclusions from that statement. Obviously, the report is going to be coming out very soon—by the end of the year. They can look into this in more detail when it does come out. What’s next? I mean, you touched on this before, but when you’re all completed, all the work is done, you said it’s going to be published as a paper. Please describe that process for our audience so they can know what to expect. LH: I don’t believe it’s going to be one paper. I think it’s going to be several papers. Before I get there, let me talk about something else that’s really kind of an important idea here. If it truly was fire, as NIST believes it is, or say they believe it to be, then there had to be a professional responsibility to change the codes so that we as structural engineers of record can prevent a failure like this in the future. Yet nothing like that was done, to my knowledge. Secondly, if it was not fire and was something else, then there’s a responsibility to make people aware of what really did truly happen. And I don’t see that evidence either. So if there was a fire issue, then there had to be a responsibility to change and update the codes to protect against future fire damages. But if you go back and you look at history, take a look at the number of buildings that have come down because of fire—ha, there aren’t any. So, at the end of the day, that gives you some indication of the fact that this building—there are more questions than there are answers. Now, coming back to the question you asked: We will probably submit several papers for publication. And right now my Ph.D. student is working on about four papers in his Ph.D. Three of those are not related to World Trade Center 7 but they are related to fires and to fire testing and to fire codes and to fire responsive behavior. And the last paper is on the progressive collapse of this building. I expect there to be at least four papers come of out this study—and I’m talking about in respected journals around the country. I’m not overly optimistic that they will be published in this country. I’m probably going to submit them in Europe or some place like that where people are more receptive to reviewing them scientifically, and maybe there won’t be as much politics involved in what may or may not have happened here. AS: Yeah, to me, from what I’ve experienced, it’s not even a question of science, it’s a question of politics—and psychology, too. Because a lot of what holds people back from doing a fair analysis is preconceived notions that they won’t let go of. But I do want to see this out around the world. I know the difficulties we face her in the United States in getting information about this building out. What kind of challenges do you expect to find when the paper is published? What do you anticipate are the criticisms or problems that people are going to try to find with the work? LH: You know, I don’t even know. I don’t know that there could be too many challenges if it’s published in a respected, peer-reviewed journal, because those are supposed to be scientists that review it and agree that the science is correct. AS: That is how science works. That is how we come to truth. And I think that is the best answer that I could’ve heard. You’re a teacher, and you have to deal with students throughout the year, and you talk to them about the profession that they want to take on—a very important profession. Every time we step into a building, we see the good work of people like Dr. Hulsey here, as the building doesn’t come down. They’re very sturdy and last for years and that requires a lot of education. What particular ramifications, for the engineering community, and your students going into their careers, will this study and this issue have, in your view? LH: Well, I think somewhere along the way we’ve got to come to a realization that it was either a fire or it wasn’t. If it’s a fire then the code needs to change—if it was a fire failure then the code needs to change. If it was not, then say that, and get on with the business at hand, and we move and we fire-protect the buildings just like we have always. Or maybe do a little better job, but at least realize that it’s going to take a lot to have a problem. AS: Dr. Hulsey, I think that is a very good update. You gave us your time frame. You told us some about what your findings were. I just want to know now, do you have any final thoughts or anything that you want to get out there to the audience that I didn’t think to ask you today? LH: Well, I don’t know how well we’re going to be able to do this, but it’s my intention right now to show the building video as it’s coming down and beside it, our anticipated failure type, with our building coming down in the same framework of the video, so you could see it coming down, and the time it takes for it come down, and the way it comes down, comparison one by one, those two side by side. That’s what I want to show. If this is really very, very good—and I anticipate it to be really good—then the layman can see, without having to worry about the science, here’s what our analysis shows, here’s what the building did. AS: Well, that is going to be available for everybody to see. I know there’s going to be a lot of interest in this. So, when we have the video, we’ll direct everybody to it. Dr. Hulsey, I know it’s been a long time you’ve been at this. Believe me, I know what it’s like to be on a projects for a number of years and be coming towards the completion of it. I’m working on one right now. So I appreciate all the hard work that you and your students have put into this. Looking forward to the results. And thank you so much for coming on 9/11 Free Fall. LH: You betcha. You have a good evening and a good day.